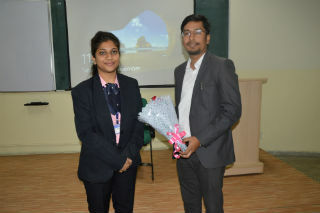 An impressive guest session was organised for PGDM-1st year students on the title “An Ode to Dreams and Passion” on 18th Nov, 2017 by Mr. Anurag Srivastava, Director, MAD OVER PRINTS. He was an enthusiastic speaker and encouraged students to stay motivated and reach their planned goals and fulfil their dreams. The session revolved around discussions on fulfilling one’s own dreams and the desired level of passion to work towards it. Mr. Anurag shared his own inspiring story of chasing his own dreams and turning them into reality, letting us know his relentlessness to achieve the same. During the talk, Mr. Anurag talked of the challenges most of us face in our lives. The main issues that needed strategizing include “Time Management” and “Innovative Thinking.” The speaker suggested certain strategies that can be used by an individual to utilise time more effectively and increase time management skills. He stressed that although the concept is not very difficult, yet it is hard to practice. The second aspect was focused on innovative thinking. Mr. Anurag shared his own experiences as entrepreneur and emphasised that such thinking can be developed by finding new ideas, working on them, changing perspective of the world and working in collaboration. 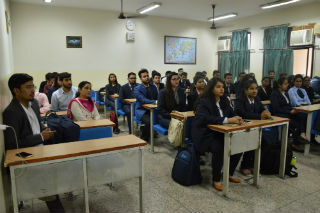 The session proved to be fruitful and an impactful one while the students look forward for such sessions in the future.